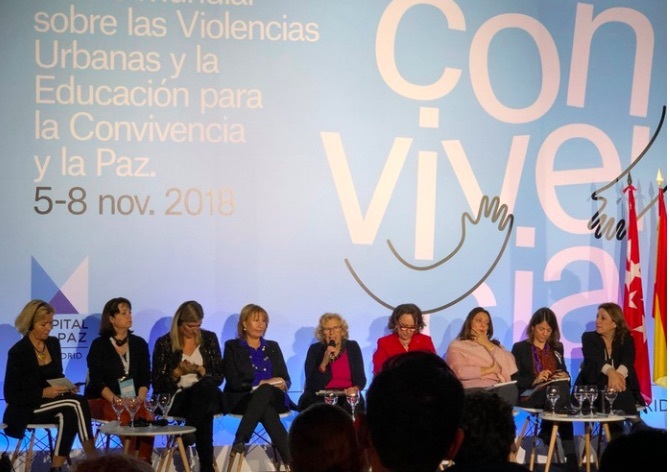 Ten women leaders of politics and society closed today [Nov 8] the II World Forum on Urban Violence and Education for Coexistence and Peace in Madrid with a message of peace. For two hours before an audience that interrupted the interventions with applause, the participants discussed from a feminist perspective a large part of the topics of the forum organized by the city council of Madrid in the Matadero cultural venue, which included dozens of papers, workshops and events. Mayor Carmena had the last word, sending a message of hope and asking for a cultural change. “Why have we chosen this extraordinary panel to finish? It has an explanation: we have defined 2018 as the violet year. Millions of women went out to the streets to remember that the prominence of women is still pending. We must be protagonists in the 21st century and in the following centuries,” she said. “Violence is still linked to the culture of machismo and that erroneous concept of masculinity. Earlier we heard that in Latin America there are 400 homicides a day. But that statistic does not say that most are committed by men. Just 1 percent are committed by women,” she added. “We have to say it. Women do not have their hands stained with blood, “said Carmena, who nevertheless pointed out that the culture of peace has been moving forward in the 20th century despite the atrocities of world wars. As noted, interpersonal violence has been reduced by 16 percent. “And that’s partly due to the triumph of women’s values,” she said. “You just have to read the women of the past. The war correspondents all spoke against the war, but they were not listened to. Now we are here their daughters and granddaughters so that it is known that the voice of women is the voice of peace “. To the data of 400 daily homicides, she added that more than half of citizens say they live with fear. In addition, she stated that many countries in the region are among the worst in feminicide statistics. “We must change the conception of masculinities and we must ensure that women have more autonomy,” said the Costa Rican official, who also pointed out some immediate measures that can be taken to reduce violence in the cities. “We know that where public areas are set up for sport, culture or art, violence is reduced. We know that where there is less overcrowding violence is reduced. We know that putting more light on the city reduces violence. But we also need a longer-term vision,” she said. The Latin American region was also represented by the president of the Association of Municipalities of Bolivia, Rocío Alejandra Molina, and by the mayor of Rosario, Mónica Fein. Molina said that her country is in a “process of change” and stressed that more than 50 percent of Bolivian parliamentarians are women, but that there is still much to be done to eradicate “structural violence.” For her part, Fein recalled the strength of the feminist movement in Argentina and the struggle to pass a law in favor of the voluntary interruption of pregnancy. “We have won many battles, but there are still many battles to be fought,” she warned. Other participants in the panel included: Liv Torres, executive director of the Nobel Peace Center; Concepción Gamarra, mayor of Logroño and first vice president of the FEMP; Beatrice Fihn, executive director of the International Campaign to Abolish Nuclear Weapons; Emilia Saiz, General Secretary of UCLG; Elena Biurrun, Mayor of Torrelodones, and Tunisian Ouided Bouchmaoui, Nobel Peace Prize 2015.